One of the unwritten rules amongst most of my coworkers that travel a lot is that you shouldn’t waste a business trip meal eating someplace we could eat back at home. So that usually means seeking out at least one of the ethnic cuisines that aren’t well represented in our neck of the woods, in this case, several of us knew of a decent Thai place down the road from NASA Goddard in Greenbelt, MD: the oddly-named Siri’s Chef’s Secret. Siri’s describes themselves as “Thai and American Food”, but with the exception of the dessert menu, most of the menu is straightforward Thai dishes, with just enough American food that if you brought a group and one person wasn’t comfortable with Thai food, they’d be happy. But they’ve got most of the major dishes I look for, including Tom Yum and Tom Kha soups, several rice dishes, basil dishes, and noodle dishes, served up with levels of spice ranging from mild to truly spicy (also a pleasant departure from the generally light spicing of Northern New England). 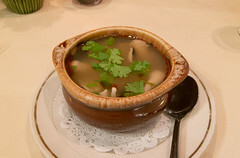 I ended up starting with Tom Yum Gai soup, and Siri’s rendition of this was quite good, with a nice, bold broth with plenty of lemongrass, pepper, and straw mushroom, the way I generally like it. 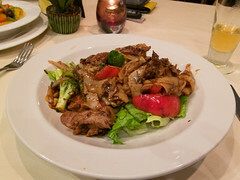 My main course was one of my favorite Thai-style dishes: drunken noodles with roasted duck. Everything about this dish was pleasant: the noodles were thick and still a little toothsome, with a light crisp on the edges where they got fried a bit. The sauce was a pleasantly spicy drunken noodle sauce with a nice red curry-like flavor to it, and the duck was crispy and tender, and the little bits of crisped Thai basil finished it off nicely. A good, solid dish, one that I would love to have again. 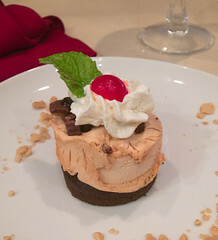 And, as I mentioned above, the dessert menu was primarily American and not Thai… so I ordered the Peanut Butter Cup. A nice set of chocolate cake layers topped with a light, soft peanut butter ice cream, this was an unusual finish to a spicy Thai meal… but one that worked, putting out some of the residual fires nicely.